Rochester Hills, right next door to the city of Rochester, is a 32 square mile city in Oakland County, Michigan. It is a highly sought-after place to live. Known for its beautiful rolling hills, its well-educated population, and its lively shopping areas. Rochester Hills is home to many great schools and colleges including Adams High School, Oakland University, and Rochester College. Because of the many available schooling options, Rochester Hills is a great place to raise a family. Its residents boast of safe neighborhoods, quality schools, and beautiful scenery. Every fall, residents of Rochester Hills and surrounding cities travel in groves to one place: Yates Cider Mill. Yates is considered by many residents have the best apple cider and donuts in Michigan. It proudly to serves its customers warm donuts and cold cider year after year. People travel from all over southeast Michigan to come drink their cider, eat their donuts, and walk their nature trails. It’s a fun place to bring the family and enjoy a sunny Sunday afternoon. If you’d like to learn more about Rochester Hills, please visit the City of Rochester Hills website here. The above photo shows beautiful Rochester Hills kitchen remodel of ours. We gutted the entire kitchen, re-worked the layout, and installed all new materials. 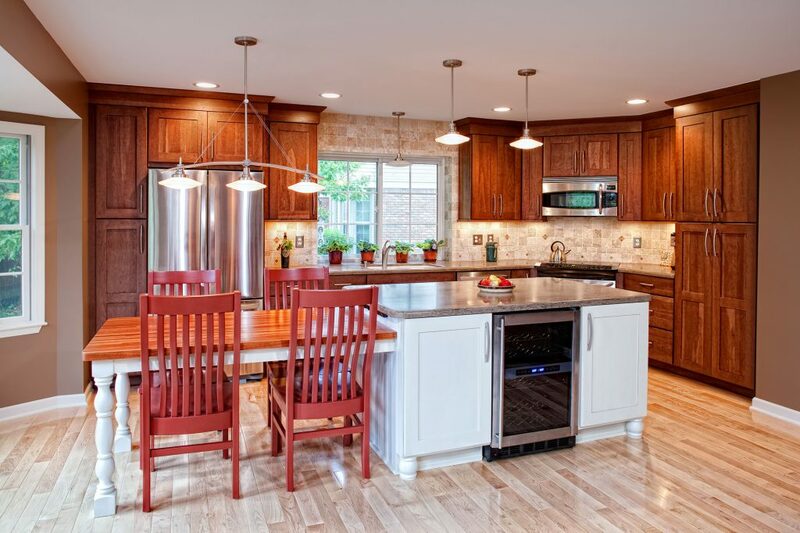 The cherry stained cabinets contrast well with the white island and light wood floors. The red chairs and hanging lights add a splash of creativity to the kitchen and tie it together really well. 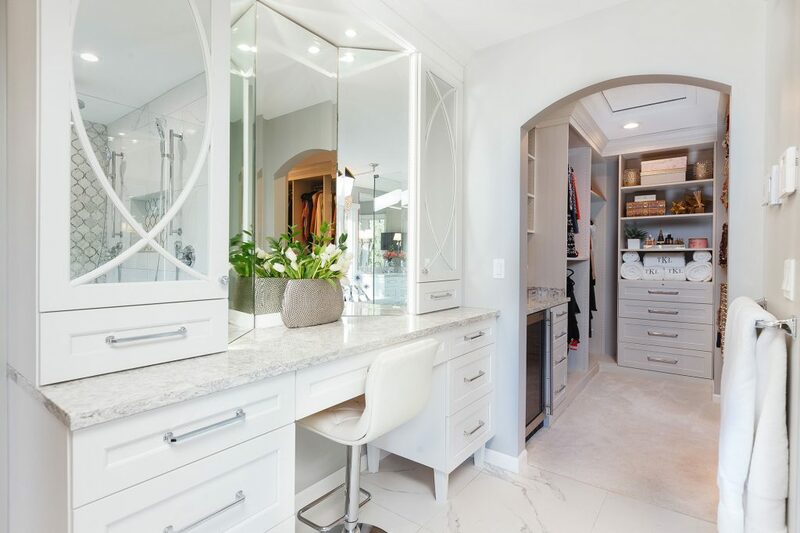 The picture to the left shows a Rochester Hills bathroom remodel where we knocked down wall and expanded the space to a large bathroom with a seated makeup area. The homeowner now has plenty of room to move around and get ready for the day. We won the Best of Houzz Design Award for this bathroom.